Water ingress into underground parkades can cost tens or hundreds of thousands of rupees to repair. And one of the common solutions … using concrete injection to seal these leaks only lasts for a limited time. 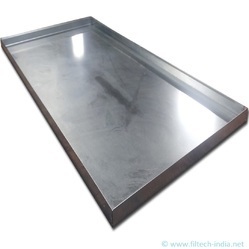 Bomb Door Drip Tray for Textile Industry is a hydraulically operated for drip collection during capillary action & peripheral filtrate collection during cake discharge. We are one of the conspicuous names in the industry for an inclusive range of Drip Trays for our valuable customers. These products are made from high quality components. Available with us is a wide range of drip trays. These are meticulously designed by our team of adept professionals and reflect the innovative craftsmanship. Our company is engaged in offering our clients Stainless Steel Glasstop Drip Tray, which are highly appreciated by our customers. These Drip Trays are manufactured by fine quality material, which ensures its best quality.